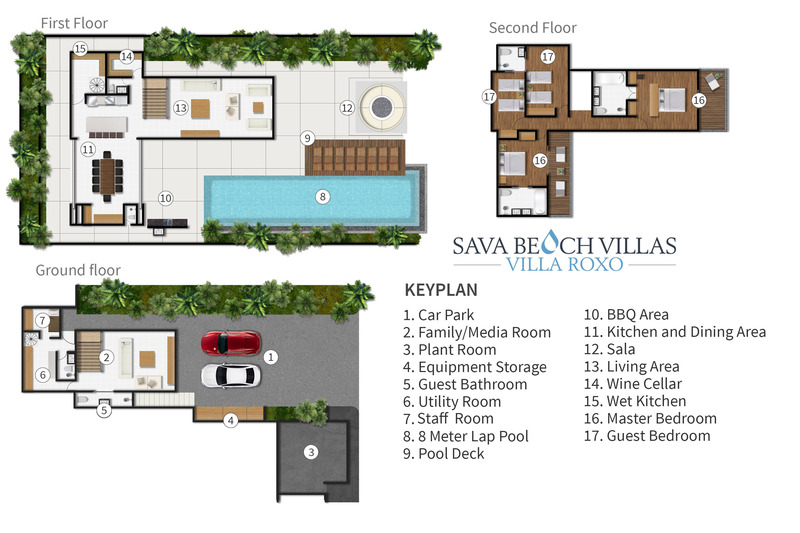 Villa Roxo is arranged over three levels, with its top two floors offering fabulous sea and sunset views. Tucked away on the ground floor is a comfortably furnished TV room and a staircase leading up to the first-floor, where an open-plan kitchen, living and dining room forms an L-shape around the terrace and sparkling 18-metre pool. The villa’s four bedrooms, three with sea views, are situated on the top floor. Roxo’s two king-bedded master suites are romantic havens fronted by floor-to-ceiling glass and private balconies with blissful ocean views. Vaulted roofs add a sense of grandeur to the rooms, with more lavish touches including walk-through wardrobes, TVs and ensuite bathrooms, one with a terrazzo soaker tub. Connected by a shared bathroom, these two stylish rooms with sea or garden views offer a comfy retreat for guests of all ages, with the flexibility to convert their twin beds into king-sized beds. Both peak-roofed rooms are stylishly furnished, and one is equipped with a TV. Roxo’s first-floor living and dining area forms the heart of the villa, and opens completely to the generous pool deck to create an expansive entertainment space cooled by the ocean breezes. This open-plan area houses a modern guest kitchen, dining area and living room decorated in earth-tones that bring a calming balance to the vivid sky and sea views. On the ground floor entry level is a TV room with a sofa and flat-screen TV and a choice of games and toys including a foosball table. Villa Roxo’s stylish pool terrace is an inviting spot for entertaining or simply relaxing in style and comfort. Its 18-metre infinity pool stretches towards the horizon and is framed by a spacious sundeck furnished with a loveseat and sunbeds and featuring a dining sala and barbecue area.